You’ve spruced up your Word Document, added a Table of Contents and have your cover art ready. But when you hit upload to Amazon, it complains that NCX View is missing. Huh? What is it and how does one use it? Hint: Before uploading anything to KDP, consider converting your document into a .mobi file and looking at it in Kindle Previewer. 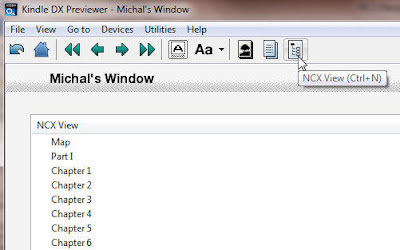 There is a option "NCX View" that you can select. You can then double-click on all of the Headers and jump to them, much like a Table of Contents. So why would you need an NCX View when you already have a hyperlinked Table of Contents? 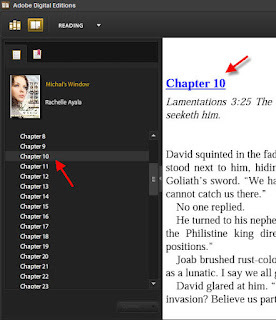 It turns out that Amazon Kindle EReaders make use of the NCX View to allow Kindle users to jump from one Chapter to Chapter. Kindle:5-way controller: The 5-way controller enables you to quickly perform many common taskson your Kindle. It has a center select button plus four arrows. To scroll up or down on a page,use the Up and Down arrows. When reading a book with chapters, you can use the Left and Right arrows to skip through chapter by chapter. Kindle Touch:If you prefer, you can change pages by swiping the screen with a finger. To go to the next page, swipe your finger from right to left across the screen. To go to the previous page,swipe from left to right across the screen. To go to the next chapter of a book (or the next article in a periodical), swipe up the page; to go to the previous chapter, swipe down. Please note that swiping to change chapters is not supported in all books. Is jumping from chapter to chapter that important for fiction writers? For that matter, does having a Table of Contents matter? After all, many fiction readers are content to sit with a book and plug a bookmark to keep their place. Few look at the chapter headings, especially if they are non-descriptive. 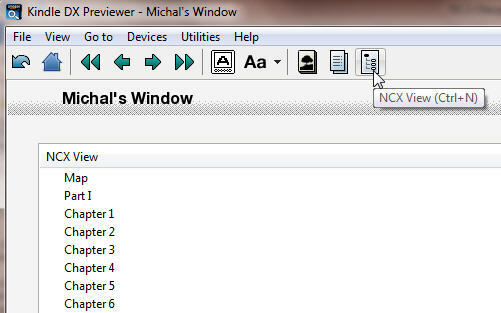 A point can be made that an author can skip the Table of Contents and NCX View. Perhaps most of your customers do not care, or they read with a Kindle App on PC or Mac where they can easily access the Hyperlinked Table of Contents. However there will always be a set of customers who are addicted to navigating with the joystick. I checked a couple of newsgroups and one person wrote that his boss insists they include it. Another said lack of the NCX view makes the work look amateur. And I definitely do not want to mark my ebook as amateur with missing items! 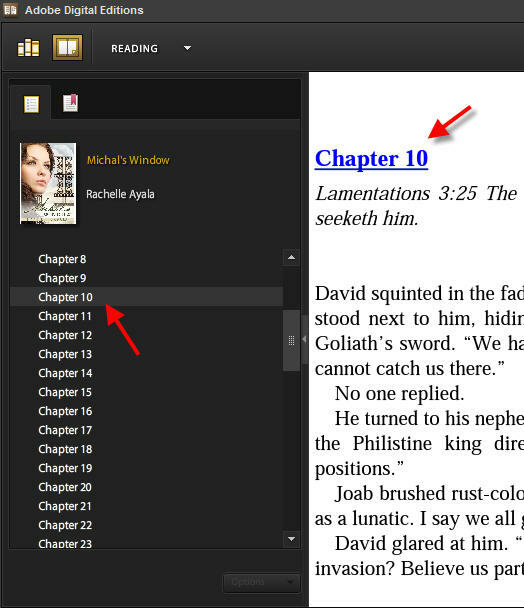 Several EPUB readers rely exclusively on the NCX View for navigation. Adobe Digital Editions is one such free reader. Again, it is a matter of reader convenience. If you don't have this navigational aid, your reader has to remember to add bookmarks or remember the approximate page where they left off. The Smashwords Meatgrinder will produce files with NCX and Table of Contents in place. However, due to licensing requirements, you cannot use a Smashwords generated MOBI or EPUB file to upload anywhere besides Smashwords. 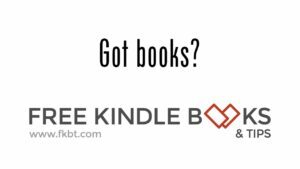 So if you do want to generate your own MOBI or EPUB files for Amazon, Barnes and Noble and Google Books, prepare to spend a lot of time learning the tools, Kindlegen, NotePad++, or coding your own tools and laying the files into the Zip container by hand. And don’t forget to download Amazon’s Kindle Publishing Guidelines. Don’t give up! Once you master the process, you can brag to your friends all about Containers, manifests, metadata, XHTML, and CSS Style Sheets. What I did was write a Java program to translate Microsoft generated Table of Contents entries in my HTML file into Navpoints. I then created a build file, the OPF, and linked everything in so that I have both an HTML TOC and the NCX View Navpoints active in my ebook. I do offer formatting services for those who want to take it easy, so don't fret. Visit my Formatting page. What do you think? Do you use NavPoints in your reading? What kind of device do you have? Or do you read on your PC/Mac? Skipping chapters is really handy when going back to, say, an anthology you've read previously. You can skip stories that you didn't like with one button click or swipe. Thanks Larry, you just gave me a use case I hadn't even thought about.